Greensburg, In. 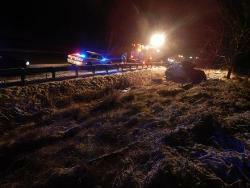 — Indiana State Police say a Greensburg man was killed in a 33:30 a.m. crash on I-74 in Decatur County. Fifty-eight-year-old Rickie Meece was eastbound when he drove off the south side of the roadway and struck a guardrail. Following the impact the vehicle rolled several times and ended up off the side of the roadway. Meece was declared deceased at the scene. Evidence at the scene suggests Meece may not have been properly restrained. Drugs and alcohol are not suspected, however, toxicology tests are being conducted.